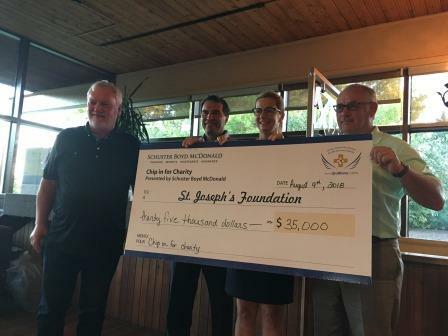 Wishes Are Coming True at St. Joseph’s Villa! 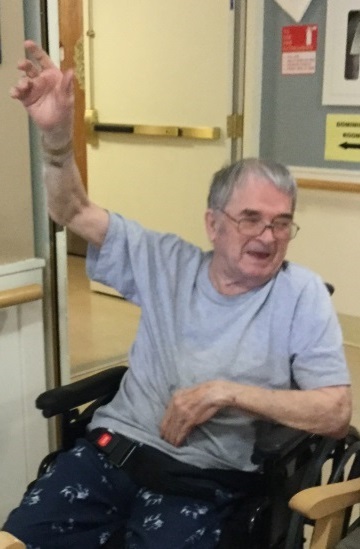 June 2018 – Senior’s Month at St. Joseph’s Villa has concluded and it was another successful month that including a number of special events facilitated by the Life Enrichment Department. The residents of St. Joseph’s Villa attended a 50’s and 60’s sock hop, a summer carnival and were treated to a barbeque lunch. The Make a Wish (MAW) announcement was also made on the day of the barbeque. 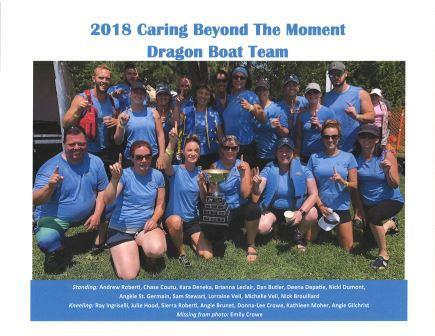 The Make a Wish Program is held each May where residents, families, staff and volunteers can nominate a resident to receive a special wish each senior’s month. It was an emotional and joyous afternoon for Mr. Bob McGown who was named the 2018 Make a Wish recipient! 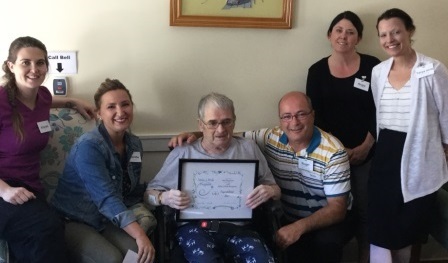 Bob was nominated by Jennifer Gosselin, the Registered Social Worker at St. Joseph’s Villa. Bob’s wish was to receive a bird-themed room make-over. The Make a Wish committee is currently in the midst of planning a shopping outing with Bob to pick up all the items the MAW design team will need to turn his room into a cozy sanctuary! 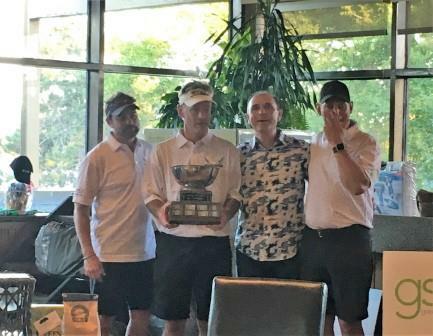 Congratulations Bob! 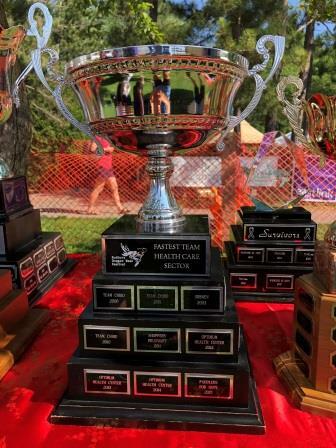 World Elder Abuse Awareness Day – June 15 – attempts to shine a light on the problem of physical, emotional, and financial abuse of elders around the world. In June each year, Ontario celebrates seniors and recognizes the contributions they make to our communities. As part of our senior’s month celebrations St. Joseph’s Health Centre is participating in World Elder Abuse Awareness Day. The day aims to focus global attention on the problem of physical, emotional, and financial abuse of elders. It also seeks to understand the challenges and opportunities presented by an ageing population, and brings together senior citizens, and their caregivers, national and local government, academics, and the private sector to exchange ideas about how best to reduce incidents of violence towards elders, increase reporting of such abuse, and to develop elder friendly policies. Estimates indicate that by 2050, the global population of people above the age of 60 will exceed the number of younger people. 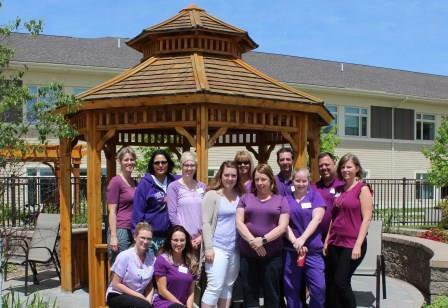 In recognition, staff at each of the St. Joseph’s Health Centre Long Term Care Homes, namely, St. Joseph’s Villa and Villa St. Gabriel Villa joined together and wore “purple” to encourage attention and support the venue. 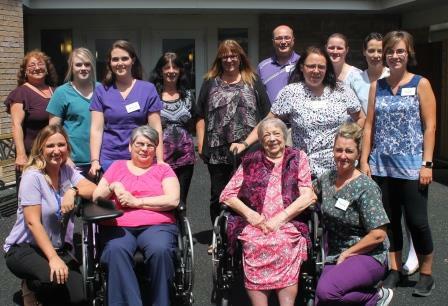 Villa St. Gabriel Villa Resident Celebrates 100th Birthday! 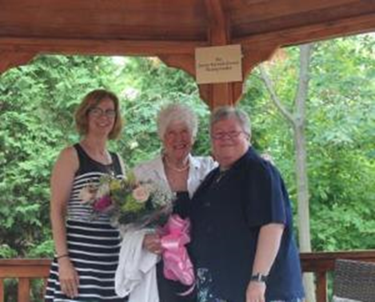 Left to right: Luella Purcell, Carole Poitras, Vermillion Life Enrichment Assistant & Audrey Johnson, daughter of Luella. 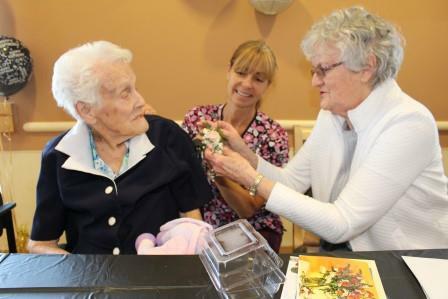 On the 26th of April, residents, staff and volunteers of Villa St. Gabriel Villa gathered together with the Purcell family to celebrate resident, Luella Purcell’s 100th birthday. 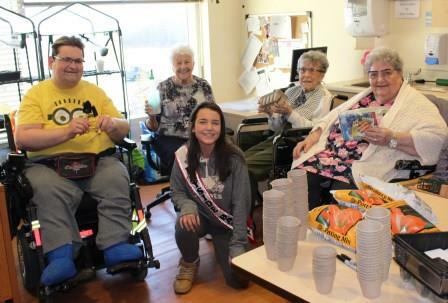 The festivities included 100th birthday decorations, cake and beverages, along with live music. 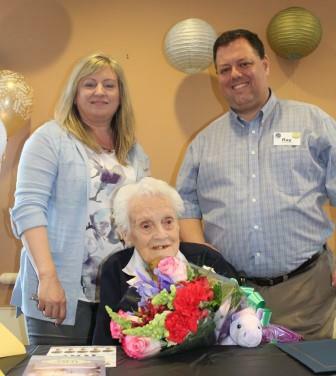 Site Administrator, Ray Ingriselli and Director of Care, Claudette Lacasse presented Mrs. Purcell with a certificate of acknowledgment to mark her 100th birthday. It was a beautiful afternoon and an absolute honour to celebrate this very special milestone with her.